Rent from the owners and save some money! Getaway with your loved ones and escape to Sunriver. Near the renovated Village Mall and Sunriver’s newest aquatic attraction, our home is located in the center of fun and tranquility. 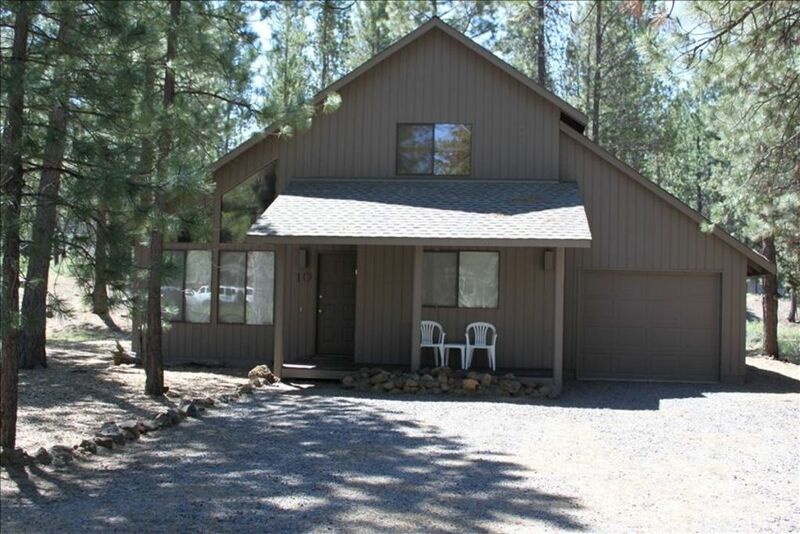 Relax in your private hot tub or walk to the SHARC and soak up Central Oregon’s sunshine! Our vacation home has the master bedroom on the first floor and has a queen bed with luxury linens provided. The second bedroom also has a queen bed and luxury linens, while the third bedroom has two sets of bunk beds. All three bedrooms have TVs/DVDs. The living room with floor to ceiling windows provides a ton of natural light. The living area also includes a gas fireplace, 27-inch TV with DVD and VCR, stereo with CD player. New flooring installed throughout first floor in December 2016. The kitchen is open to the dining area. The kitchen is well stocked with everything you would need including a dishwasher. A sliding glass door off the dining area leads out onto the deck. Hot tub to accommodate 6 adults, gas barbecue, and patio furniture. A large common area with open Ponderosa Pine forest extends from the deck. The SHARC Facility (Sunriver Aquatic and Recreation Center) is a huge aquatic facility that has a lazy river, water slides and tot pool, sand play area, indoor & outdoor recreation pools, outdoor hot tub, fitness center, amphitheater and so much more! Our home is walking distance to this facility and 6 passes are included for guests to use. A single-car garage provides parking out of the weather. Adult and several children's bikes are available for guests. Winter fun in Sunriver! This is a photo of our annual sledding trip. We love Sunriver! My parents took a vacation every year here and I wanted to continue this tradition with my own children. We love the summers and the winters in Sunriver. It has always been our dream to own a home here that we can enjoy with our family. Our home is very kid friendly, we have 3 children of our own. We keep our bikes there and plenty of games to entertain the little ones. Many different board games and puzzles. Pool is located at the SHARC which is about 1 mile from the house. We have 6 guest passes available. Enough space for the family to spread out but not so much you spend your vacation cleaning house. One tomorrow f the nicest things about this house was the generous supply of towels and linens in the bedrooms, baths, and kitchens - lots of cozy throws and plenty of hot tub towels. Comfortable and clean. Had everything we needed. Loved the SHARC passes. Thank you!! We had a wonderful Labor Day weekend! Just what we needed. Easy access to everything in sun river. Property was clean. Had issue with hot tub at beginning of stay and texted owner, repair service was there within 10 minutes! Great service, very attentive owner. Great location. Nice clean house perfect for our family. We loved the hot tub sharc passes and bikes. Great place to stay in Sunriver. The location is excellent. Very close to SHARC and the village. We used the provided SHARC passes each day of our visit. The house is comfortable and well appointed with family in mind. The children in our group loved the bunk bed room. Beds were all comfortable and the hot tub was a nice treat. The kitchen is well stocked and everything was neat and clean. We would recommend bringing your own bikes. Though it is very nice of the owners to make bikes available, they are in poor condition and were, for the most part, unridable. Sunriver is a great family destination. The house was in a fantastic Location. When we arrived housekeeping was just finishing and the home was very clean. The hot tub didn't seem to have any chemicals in it which seemed a bit weird. Other than that we had a great stay!